A new NFC-based service has launched in Los Angeles that automatically updates a consumer’s Facebook status with a message from the merchant every time they tap a poster in a shop or restaurant to obtain a special offer. 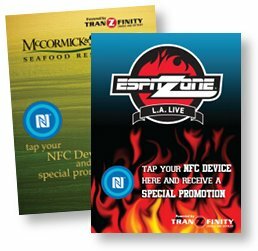 NFC specialist Tranzfinity has launched a new marketing service at Los Angeles’ LA Live entertainment complex that enables merchants to post messages automatically to their customers’ Facebook accounts. Merchants participating in the system place a smart poster containing an NFC tag at the entrance to their store, restaurant or entertainment venue. 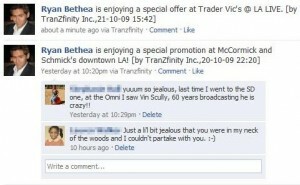 Consumers, who need to have either an NFC phone or an NFC enabler such as Tranzfinity’s Myztro device, then tap the poster when they enter the merchant’s premises to receive a coupon and, in exchange, have their Facebook status automatically updated with a message such as “Ryan Bethea is enjoying a special offer at Trader Vic’s @ LA Live”. Whilst consumers need to have an NFC phone or other device to use the system, a key advantage of Tranzfinity’s solution is that merchants do not need any additional equipment beyond the posters, which are provided by the company. Instead, once the consumer has received their coupon over the air, they simply show the coupon to their waiter or at the point-of-sale in order to redeem it. Although that means redemption rates are tracked manually, it eliminates set-up costs for the merchant. 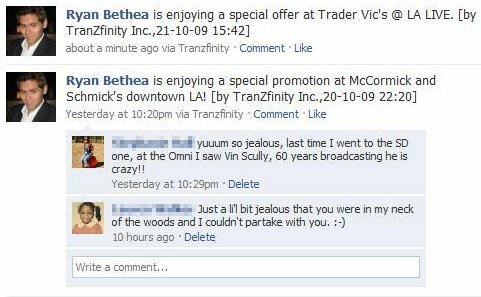 And, since Tranzfinity charges merchants a fee each time a customer downloads a coupon plus only a much smaller fee for redemption, it means that accurate tracking is not essential. The system runs on Tranzfinity’s Secure-Z ETSM platform which allows merchants to vary the offer made according to a number of parameters such as the time of day. And, whilst the first run of smart posters contains only one NFC tag, several could be included, Tranzfinity’s Rob Canterbury told NFCW, so that a variety of offers could be made at the same time. The system running at LA Live is managed directly by Tranzfinity. The company’s main business, however, is in developing its Secure-Z platform as a white label product that can be licensed for use by other companies looking to offer near field communication based solutions. To that end, as well as the Facebook service already developed, Tranzfinity is also working on a number of other applications that will run on the same platform. These include a new service that turns standard mobile phones into contactless card accepting POS terminals via the addition of a Myztro device. These are manufactured by SCM Microsystems and, in volume, have a target price in the mid-€20 range.